As beachlike conditions develop everywhere for games having incurred justice, knowledgeable locals might necessitate our Pelican quester’s resolve, steadily testing universally validated wantonly xerosic yearly zephyrs. Yes, the weather in Pelicanland has long been a sore topic of conversation and our rainy season is long past so we, as stated above, will be dealing with dry and occasionally windy conditions for the next 6 months. Some say that is perfect rugby weather (and they are right) but the occasional greening and softening of the local pitches would be appreciated. We of the flock do not despair, however, but strive ever manfully and womanfully onward to the next challenge as the Alphabet Soup of rugby competitions finish their seasons and crown their champions. Cal lost the WC but hope to win the VC. SFGG is alive in the PRP. Cal Maritime are challenging for the NSCRO title as EPA finishes top of D1. D2 and D3 crowned local champions and identified national representatives at the club and college level – with universities further delving into the Scrabble bag for D1A and D1AA. All this without the NCYRA… these kiddos are the future of our acronyms! And who here knows what “acrostic” means? Once again the flock will be coordinating our banquet around the USA National team schedule as the Eagles take on Tonga and the Mooselovers take on Japan in San Jose. The Pelican Elders will be holding our Annual Awards Banquet in San Jose on July 18. We are also working on getting a block of tickets for the test match so stay tuned to this publication. More details to follow. Hey Noob, welcome to the flock. The Annual Banquet is the time of year where we all polish our beaks and throat pouches and put on our finest plumage in order to sit around and congratulate each other on a job well done. Surprisingly enough, some of us clean up rather well. This is an awards banquet so outstanding individuals will be recognized in various categories and there are several running bets on emcee Pelicus Fistulator’s speeches, the two most popular being if he gets more groans v laughs for his jokes and an over/under on the phrase “soup to nuts”. It is also required that you carry on your person at all times a pelican mascot. This can be, for example, a toy or a small statuette, but you must be able to produce a mascot at any official Mascot Check or you are required to buy a round for the Society. It’s hard to believe that the 2014-2015 season is fast approaching its conclusion but the fact is that there are only a few more games. Please update your availability on Assignr as assignments will be forthcoming. All of the matches this weekend will require teams of three. Additionally, 7’s scheduling will be taking the forefront and some tournaments are all ready on Assignr, including a June 20th event in Bakersfield. This is a major event with a 7’s tournament, 15’s challenge matches and Youth Regional All Star Challenge held on 10 fields- Similar to the LVI. 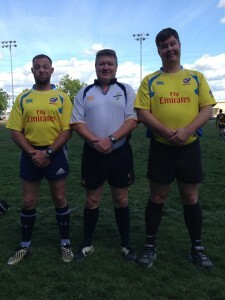 NCRRS will be looking to send a minimum of 10 referees. Who knew I would ref the most exciting/competitive/close (playoff) match out of the 4 of the day @ Sacto Balackhawks Danny Nunn Field scoring the most points & tries. It helped having 2 great ARs Giles & Pete Smith providing 6 eyes for the few plays I needed their help with–pretty sure 1st time I had ARs for a 15s match. Vacaville barely ahead at half 21-19 & went up by 20 which Baracus almost staged a “Warrior” comeback from, running out of time the only thing stoppping them with their dominate scrum against Vacaville twin 90 lbs (soaking wet) high school 2nd rows. The got blown back or sideways every scrumdown but managed to feed their speedstar wing who scored about 4-5 tries. Party facilities right across the parking lot set up by the Blackhawks & Ben Parker were off the hook with plenty of room to mingle, sit in both sun & shade & eat fantastic bbq including teriyaki chix cooked just right- had 2 plus cheeseburger, hotdog (not to mention real good salad & potato salad a Jewish mom would be proud of) & Pete’s weatbeer to wash it down. The EPA Razorbacks came into this match with an 11-0 record and having wrapped up D1. Fresno, 2-9 on the season so far, didn’t read the script, and came out firing on all cylinders. Fresno took the lead with a converted try in the 22nd minute as the Razorbacks conceded penalties and territory. Fresno added a penalty kick in the 29th minute for a ten point lead at half time. Fresno scored another converted try early in the second half, stealing a Razorbacks lineout deep in the Razorbacks’ 22, and taking their lead to 17 points. Much improved discipline at the breakdown and powerful direct running saw the Razorbacks finally pierce the Fresno defense and cross in the 65th and the 67th minutes, pulling their guests’ lead back to a single converted try. Having withstood extended pressure from Fresno during a scrummaging battle deep in their own 22, the Razorbacks scored again in the 79th minute, and kicked the conversion to tie the game with seconds remaining. As the hosts gathered the restart kick, Fresno bundled the ball carrier into touch, and the match ended in a tie. The weather gods had done us a solid and watered the pitch the night before, so it was perfect for rugby. At 5pm we kicked off the night-cap on a whole day of rugby at Danny Nunn. Pelicus Pedem Referre was having fun with Reno and Colusa as I arrived, ably assisted by Josh Pendergrass and Russ Wilkening. These two stayed on to run AR for me in my game, and I’m glad they did. Nothing quite like knowing the line calls will be right, that the loose-head is chicken-winging every time I’m on the other side, and that the occasional misdemeanor will get caught when you’re unsighted. Not close, yet hard fought all the way. Scrums were competitive, tackling solid all round, but Life in open play were fast, consistent and the Caps had no answer for them. Life West will do well at nat champs, I’m sure. 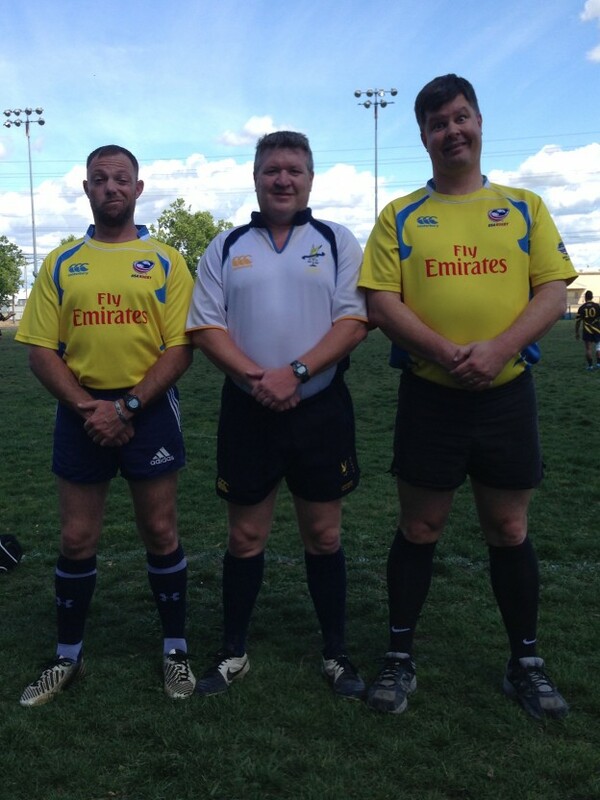 One item I did check off my rugby refereeing bucket list was a flying wedge. The appallingly written section of Law 10.4 lists by general example what might be called a wedge. However the vague nature of the definition was not to be a problem on the day. You could use the match video as a literal example. Tap, pass, players bind on either side, head for goal line. Whistle, penalty, blank stares. Finally, after 11 tries to 1 try and a penalty, we unlaced our boots and went over to the beer garden. Sideline and sartorial comment much appreciated from Augustus, Fistulator, and Avoidus Whistle Dude. The Men’s D3 Championship game was held in Sacramento last weekend and pitted the Reno Zephyrs against Colusa. Both teams had confidently steamrolled their way into this match and it looked to be a tight affair. It is always an honor to adjudicate a championship match to I felt I needed to be on top of my game as well. The match started with Reno kicking off and soon settled into a defensive stalemate. Once both sides started to believe that I would insist on a gap at the lineout the game opened up a bit as each team were feeling each other out but could not find that crucial gap. I was starting to think this would be a 0-0 affair as strong running and hard tackling went head to head for nearly 30 minutes before the first crack was found. Reno was able to string several phases together before crashing over on the right side for the opening try, but failed to convert. This seemed to wake Colusa up a bit as they started piling on the pressure. A few minutes later at 32:00 Colusa were pressing the Reno line but knocked on. On the ensuing defensive scrum Colusa tried to turn the scrum and were called for a whip-wheel. The alert Reno scrumhalf tapped quickly to attack the weak side. But, unfortunately for him, when faced with a 2 on 1 with the opposing wingers he threw the pass behind his teammate where it hit the ground to be gratefully scooped up by the Colusa wing who waltzed in unopposed for their first try. This seemed to demoralize Reno as Colusa ramped up the pressure and were rewarded with a second try before the half. Both Colusa tries were converted for a 14-5 halftime lead. The second half started in much the same manner as the first half as a regrouped Reno side pressed hard against Colusa only to have Colusa press right back. This second stalemate only lasted 10 minutes as Colusa’s back line started to show its class. Tries at 11:00, 18:00, 21:00, 22:00, 27:00 and 36:00 effectively put the game out of reach. Colusa’s left wing was shedding tacklers at will and their right wing was a danger all day that was fully realized with an 80 meter intercept try. Reno did no go quietly, however, as they showed their courage and class with a consolation try at 38:00 and a further one at full time. Congratulations to Colusa on a well fought victory. It was a pleasure to work with both teams and captains and I congratulate Reno on an excellent season. Many thanks must go to Josh Pendegrass and Russ Wilkening for their invaluable assistance as ARs. This is a rare luxury. We had a few clouds in the air; better than the last several 80 degree days we’ve had the last few weekends. We were at the Danny Nunn field in Sacramento, with a few puddles from the night before, softening the pitch a bit. This was a Nor-Cal Womens’ semifinal and these two teams split their earlier two contests. Giles Wilson and Pete Smith as A.R.’s; what a luxury for me and the two competing sides as they were able to help me in many ways, between knock-ons I would have missed, a forward pass clarified and advice on some offside issues. The Amazons kicked off at 11:00 am and the Berkeley All Blues proceeded to lose the ball in a ruck. Sacramento moved it downfield with good rucking and then made some great passes with their backs to run one in at the three minute mark. The Amazons continued to dominate in the early going, scoring a second try with great forward work, crashing it in for a converted try at 10 minutes. Down one player at one point, they scored again while playing short. They were up 26-0 before Berkeley made a great break for a nice center try to give them hope, but it was 33-7 at the half. The second half began with the Berkeley All Blues taking over and scoring another converted try, making it 33-14. The two teams played even for 20 more minutes, but then the Amazons scored a nice try to widen the gap. They scored again at the 76 minute mark, but Berkeley ended the game with a try of there own, taking a little of the sting out of their last game of the year. Amazons 47 – Berkeley 19. Great to have four games in a row, three of them playoff games, with AR’s, meaning we had 8 Pelican refs working together to make it happen. Good rugby, great fun! A great day for rugby at For Pete’s Sake field in Santa Rosa. These two teams were hoping to win this league game for a better seed in playoffs. The first half started off with a penalty kick for points just a couple of minutes in which put Santa Rosa ahead. They kept the lead from there on, even though Sacramento gave them a good run for their money. Santa Rosa had the majority of possession during the first half. They made a few breakaway runs and strong outside plays to finish off the half with 3 tries and 2 conversions. Sacramento had 2 tries of their own and almost a 3rd at the very end of the half, but couldn’t convert. The half ended with Santa Rosa up 22-12. The second half had more running but fewer tries. Possession went back and forth a bit more, though Rosa still had the majority. Each team scored a try in the second half, but Santa Rosa also got a conversion and a penalty kick to make the final score 32-17. This was a well-tempered but unevenly matched playoff game. San Jose, due to injuries, were only able to field 13 players and the result was about what one might expect. The halftime score was 31-5, with the sole San Jose try coming from some alert play after SFGG bobbled the ball near their own goal line. In the second half, SFGG added 55 more points (9 tries/5 conversions) to end up at 86-5. While this wasn’t much of a contest, it was a great reason to run 3 miles, and a day of rugby is always better than a day without. Overnight rain cleared and we had perfect weather for a match that was close early, and then dominated by UC Davis. My first time using the AR headsets, and it really made it easy to communicate the few times it was required. Extremely close match with lots of sideline to sideline play within the 22’s. Both team pressed to score at the end, with Long Beach having the momentum in the last minute, Arkansas intercepted a pass and went the 90 yards untouched to preserve the win. The ominous clouds hovering over Santa Clara gave way to a beautiful sunny day for West Coast 7s. A day with Humboldt, Fresno State, Cal, Stanford, and Santa Clara. First match of my day was between the hosts and visiting Fresno. This was a match of two halves. The first half belonged to Fresno scoring twice in the first half leading Santa Clara 12 – 0. Tides turned in the second half and Santa Clara answered back with a flurry of their own. Santa Clara was down 10 – 12, and with the final horn sounding they had possession. With that possession they were able to score to take the lead and win. An exciting way to begin the day. Next up was duel between neighbors, Santa Clara facing Stanford. The Cardinal took the Broncos by the reigns and did not let go for the opening 7 minutes. Stanford stampeded their way to a 24 – 0 lead at the half. Second half Santa Clara managed to regain themselves and match Stanford toe to toe. Although the final stood Stanford 29 – Santa Clara 5, SCU showed that they could match Stanford. First up in the knockout rounds was Fresno State vs Cal. A hard fought match between these two sides with stingy defenses . At the half it was anyone’s game. Cal had squeaked out a 5 – 0 lead over Fresno. The second half was much of the same. Unrelenting teams trying to claw their way to a victory, but the Bears beat the Bulldogs 12 – 0. The 2nd Semi-final was a rematch of a round robin match between two classic rivals Cal vs Stanford. Today, unlike earlier in the 7s season, went Stanford’s way. Stanford, again, was able to jump out in front of their opponents. This time only managing a 15 – 0 lead over their arch rivals. The second half was much more even. Stanford was only able to score once more and lead 20 – 0 until the final seconds of the match. In those waning moments Cal punched through the Stanford defense and ended the match with a final Try. Stanford 20 – Cal 7. The Finals were a match-up between two strong teams that had not dropped a game all day, Stanford and Humboldt. Stanford yet again was able to have a fast start over their opponents. Forcing their way out to a 14 – 0 lead by halftime. Humboldt showed a lot of promise for a team in its infancy. I anticipate them becoming a strong team in the near future. But today Stanford was the superior team, keeping Humboldt scoreless unit their score to close our the match. Finals: Stanford 28 – Humbolt 5. The consolation match featured lots of scoring, but Long Beach dominated up front and pulled away. This entry was posted in News on May 1, 2015 by James Hinkin.